What happens when you play with fire? You lose 27-17 @ home to an unranked conference foe. Squib kicking every time you kick-off, passing the ball on 1st and goal from the five, and playing with no sense of urgency for three quarters cost the previously undefeated Eagles a shot at the National Championship & most likely the first Heisman Trophy on Chestnut H ill since Doug Flutie. While putting 415 yards on the Seminole defense through the air and two touchdown passes seems good, its the Heisman hopefule, Matt Ryan's third (11) interception of the night which sealed the fate of Boston College. 1. BC drove all the way down the field on Florida State in the first quarter before a forced pass to reciever Marcus Robinson inside the ten yard line was picked off by cornerback Tony Carter. 2. After a Ryan toss down the sideline BC was set up, once again inside the ten yard line with 1st and goal to go. Two botched runs and an incomplete pass later, Steve Aponivicius misses a field goal wide right. Boston College fails to put points on the board for the second time in the half. 3. 4th Quarter, the Eagles are down 6 and driving on the Seminoles when they arrive inside the ten yard line once again, Boston College throws several incomplete passes, adds a holding penatly & over the line of scrimmage penalty, result = 3 Points. Boston College has successfully shot themself in the foot. Tom O'Brien style. I take my hat off to Florida State and the semi-unconscious Bobby Bowden they played with excitement all night long and put pressure on Ryan forcing him into making bad decisions. While Ryan's Heisman trophy bid may be done, his success surely won't be, expect him to be one of the top QB's selected in next years pro draft. Next up for Boston College, road games at Maryland and Clemson with a return to 'The Heights' against Miami just after Thanksgiving. Sidenote: While I'll tell you, and it may be hard to believe, I never actually went to Boston College, my seas on tickets are a result of my cousins hard work during her years as a student there, members of my family and I still enjoy watching BC Football and will for years to come. As far as "superfrauds" go? 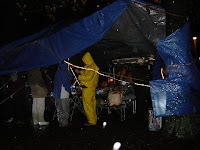 I was at Boston College Saturday night in the pouring rain for three hours tailgating before the game, the wind was blistering, the air was freezing, but I was there. That may be a sign of a severe drinking problem, but to me I can't get enough of the college football atmosphere and there is only one real D-1 Football Program in the state to cheer for, so I do. Fraud that. You are a true fan and that is not always as easy thing to be at Boston College. The weather was awful!!! The word awful does not really describe it but your picture shows the reality. It is too bad that they did not play up to their capabilities. I am an LOYAL BC Eagle fan, but they gave that game away.They could have won, they had the momentum, the fan support and the advantage. I have been at many, many BC home games and I have never seen that many people stay until the end of the game. I know they where expecting BC to pull it out in the last few minutes like at VTECH. It was a big disappointment to the BC faithful fans. Nick, You are more a superfan than a lot of people I know who went to school there.